While just about every Disney tourist would love to splurge on length of stay tickets to be in the theme parks from the moment they arrive to the moment they depart, sometimes it's just not the economical option. This leaves travelers whose flights arrive or depart during mid-day and early evening with a little time on their hands to explore other fun spots on the Disney property. 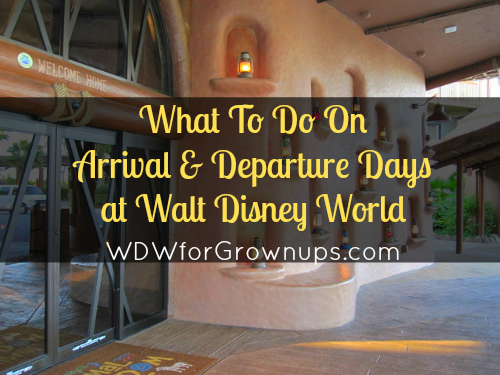 So just what is there to do on an arrival or departure day at Walt Disney World? Read on for a few of our favorite things to do on arrival and departure days! With more than 25 Disney Resort hotel locations to chose from, there's always plenty of fun themed Resorts to stop by to enjoy shopping, dining, and recreation at! My arrival night ritual usually includes hopping aboard the Magic Kingdom Resort Monorail to eat, drink, and shop my way around the Seven Seas Lagoon on a Monorail Crawl. This allows me to cap off the night by watching Disney's Electrical Water Pageant, and Wishes Fireworks from the beach. Over on the other side of the property, start your hotel hop at the Boardwalk and rent a surrey bike to ride. Guests with late night arrivals can even stop in to JellyRolls and catch the dueling pianos or dance the night away at the Atlantic Dance Hall. There is a LOT to do at this revitalized shopping, dining, and entertainment district. Catch a movie at the AMC, bowl a few frames at Splitsville, or simply shop until you drop. With a plethora of restaurants from Celebrity Chefs and a festive street atmosphere Disney Springs is an exciting place to spend some time. The SENSES Spas at Disney's Grand Floridian Resort, or Disney's Saratoga Springs Resort are the perfect places to kill a couple of hours relaxing. Schedule an appointment on your departure day to be sure you are fully relaxed before heading back to the "real world," or make it your new arrival day tradition to help mentally signal that you've left the rat race behind and you're ready to get on with some serious fun. Arriving a bit early on your first day? Pack the swim suits in your carry-on luggage and enjoy a swim or soak up the sun while imbibing in a tropical cocktail. Disney guests are permitted to use their hotel pool on check-in and check-out days, so even if your room isn't ready, it can still be prime pool time! Just leave your luggage with bell services, change into your suits in the pool bathrooms or changing rooms. Remember to pack some Ziploc bags to transport wet suits home if you'll be siming on departure day. 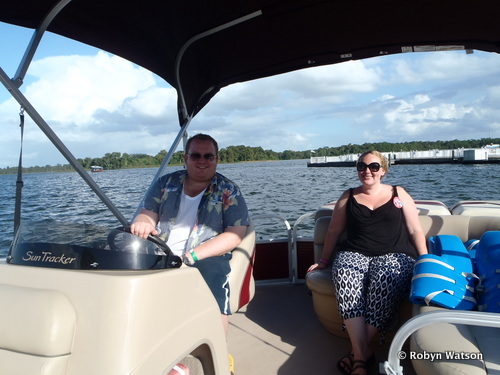 If you'd rather be on the water than in it - arrival and departure days are a great time to take advantage of one of Disney's beautiful marinas and rent a boat. Zipping across the Seven Seas Lagoon in a Sea Raycers or cruising on a Pontoon boat are enjoyable ways to get into that resort feel. What are your favorite ideas for arrival and departure days? Let us know in the comments below! Whenever we're in the parks, we never seem to have time to watch the nighttime shows in the parks, or else we're too tired from being on our feet all day. So this summer when we go, we're going to kick off our vacation with reservations to the Wishes Dessert Party!! That way, since it's not a day that we're visiting parks, we wont be as tired from walking/standing all day and we can have a more relaxed, but extremely magical, first night! 1. Afternoon tea at the Grand Floridian (book early, as it is very popular). 2. Movies under the stars at many of the resorts, but a favorite is Fort Wilderness. Be sure to buy a S'mores kit to indulge by the campfire. 3. Watch the MK fireworks from a resort beach (libations from the nearest pool bar optional). Or see the fireworks from the California Grill lounge, atop the Contemporary Resort - no reservation required. 4. 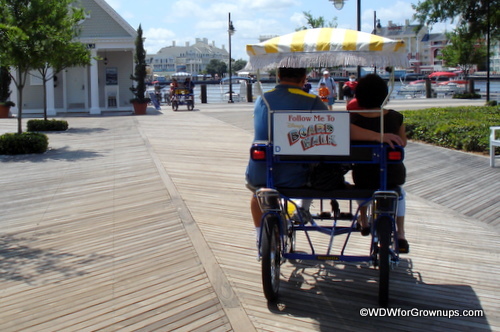 Disney's Boardwalk - lots of things to do. We like to head over to the Boardwalk to catch supper and enjoy the street performers if we roll into town later in the day. Also High Tea at the Grand Floridian followed by a dip in your resort's pool is another great option. A round of mini golf or the old standby - shopping! We like to do future world at Epcot on arrival day. This gives us time to really explore and enjoy it, and then enjoy World Showcase later in our trip. I always plan my trips flying out of Louisiana around 5am and arriving in Florida around 11am. We take the Disney Express to our Resort and try to hit the Magic kingdom by lunch. My fiancee(soon to be wife on 11/5/16)and I stroll down main street usa and grab mickey ice cream before getting on splash mountain and then eventually finding a late lunch. Leaving out on our last day we Parkhop and hit every park usually ending the night at EPCOT with Illuminations before making our way back to the hotel. Depending on the airline, our flight home doesn't depart until mid-afternoon. That leaves just enough time to visit MK and battle another villain in the Sorcerers of the Magic Kingdom (SOMK). We like to try dinner at a restaurant at a resort that is a bit out of the way--one we might not try on a "park" day. We have reservations at Chef mickeys! Plan on swimming before that! !